Please help to make the California Coastal Horse Rescue ranch a truly forever sanctuary for rescued horses. 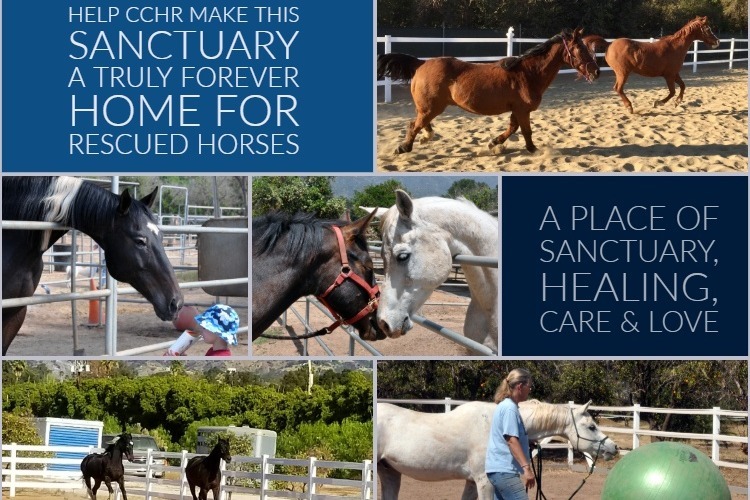 CCHR brings the horses it saves to the rescue sanctuary/ranch to help them to recover, heal, and return to good physical, mental, and emotional health. The CCHR ranch is such a special and peaceful sanctuary and it plays a critical part in the overall well-being of these horses. We hope that you will consider a donation in support of the preservation of the existing rescue sanctuary property. 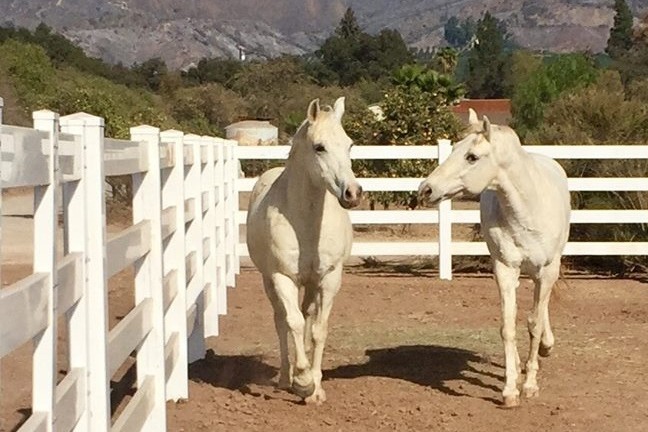 In order for CCHR to continue being able to rescue and successfully rehabilitate horses, the Rescue needs to urgently pay off the high-interest loans on the current property so it can preserve the rescue property for all the horses who live there now and those who will live there in the future. If the loans are not paid off quickly the Rescue will lose the property. Your financial support will help to secure the ranch and let the ranch continue to be a place of hope and sanctuary for horses for years to come. WHAT IS CALIFORNIA COASTAL HORSE RESCUE (CCHR)? CCHR, a 501(c)3 non-profit, has been rescuing horses in need since 2000. CCHR rescues abandoned, abused, neglected and slaughter-bound horses and provides them with a second chance for happy and productive lives. CCHR also rescues horses whose owners can no longer afford to care for them. CCHR provides shelter, food, veterinary care, farrier services, rehabilitation, and adoption services for the horses in its care. It also offers long-term sanctuary to disabled and elderly horses. With a combination of specialized care and loving support, all horses are given the opportunity to heal, thrive and to lead happy and peaceful lives. CCHR has given sanctuary to over 150 horses and ponies at its facility and has had a role in helping to place over 600 equines in new homes. CCHR is a Global Federation of Animal Sanctuaries verified organization and is a proud member of The Homes for Horses Coalition. 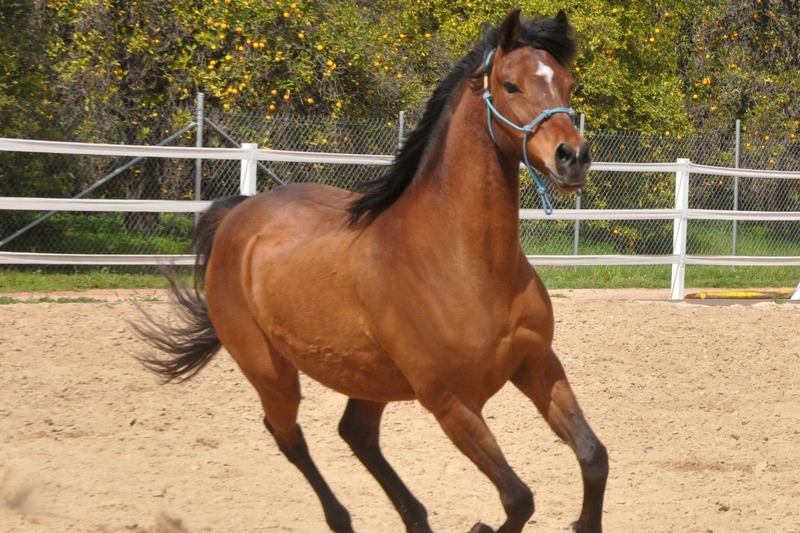 CCHR rescued Jessica, an Arabian/Saddlebred cross, from a serious neglect situation. At thirteen years of age, she had been born on the property where she was rescued from. Besides living in deplorable conditions she had lived in a very isolated world and had seen very few people in the course of her life. When CCHR went to assess her situation she eagerly came over to the gate of her stall and looked at us very expectantly. You could almost hear her say, “It’s me you have come for. I am ready to start my new life.” When we rescued Jessica (along with four other horses), she was nervous but came easily with us. Once at the rescue, we saw how everything panicked her. A fly mask, a muck cart, the sound of her water bucket being filled brought out such fearfulness in Jessica. Stimuli of any kind sent her bolting. We took it slowly with Jessica at first. Walking around the property, exposing her to sights and sounds. We all spent time with her, and she started to understand how nice all of these new people were! Little by little her fearfulness started to diminish, and her trust started to increase. Jessica’s rehabilitation has taken some time, but we are happy to say that she is doing very well. She is finishing her training and is looking for her own special person. The horse who lived in isolation and neglect for so long is one of the first horses to come to the fence to greet people. The mare who could not handle stimuli now seeks out the volunteers who give the best scratches! Although rehabilitation can be a lengthy process we know that it does work, just ask a lovely mare named Jessica! 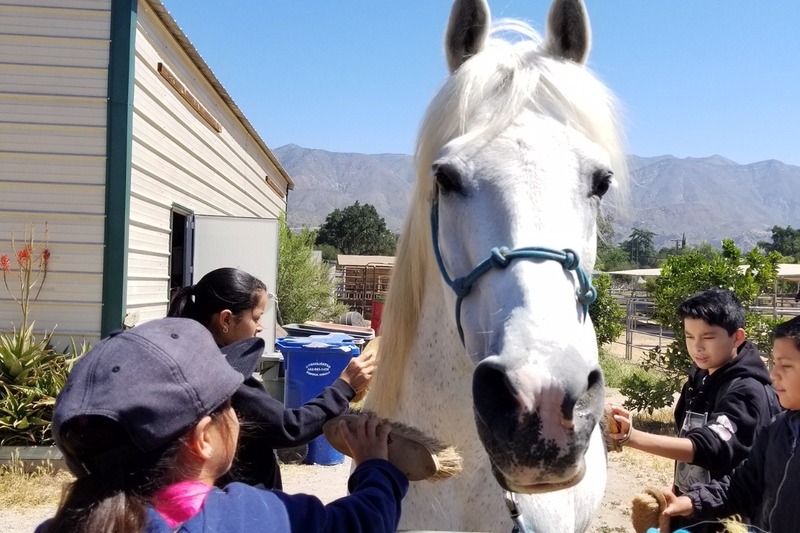 Community Connection is part of CCHR's continuing commitment to not only its horses and its rescue and adoption efforts but to the larger community as well. CCHR strives to support education, literacy and social well-being through its horses and its ranch facility. Part of the rehabilitation CCHR offers to the horses in its care is to give them a wide variety of activities to engage in. One of their most important and fun "duties" of the horses is to be ambassadors for all animals in need and to "give back" to the human community that helps to protect and support them. CCHR offers a variety of programs including its "Learn, Care & Share" educational program and its Pony Tales Reading Club. Both programs are designed to introduce children and young people to horses. 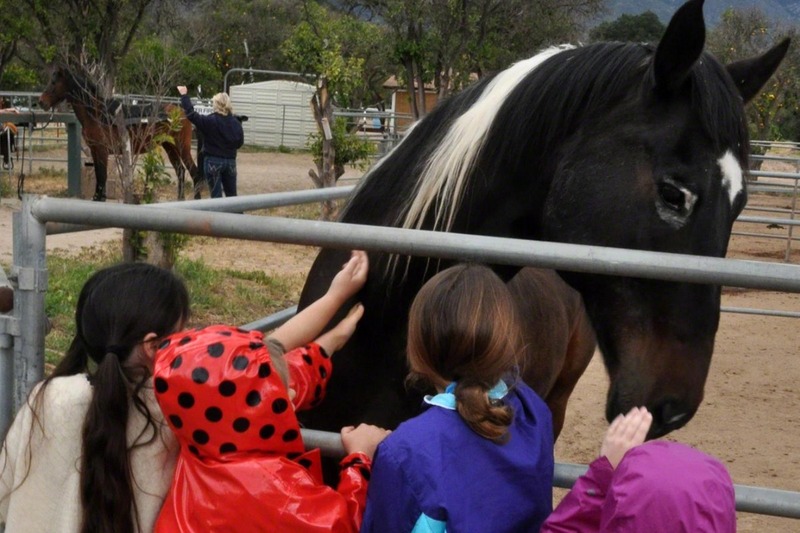 We believe children benefit from interacting with the CCHR horses (and animals in general) because we feel that learning about compassion and empathy early in life can help build moral character, reduce violence and build a sense responsibility. When its citizens are more caring towards each other and the animals who live among them, society, as a whole, reaps the benefits. This program also allows the CCHR horses to interact with children. For horses with trust issues, we have found that children offer them gentle and happy interaction which can, in turn, help these horses to more readily accept people in general. Giving back to the youth in our community.